Curiosity, the ultra-sophisticated rover on the U.S. Mars Science Laboratory mission, lifted off for Mars on 26 November from Cape Canaveral, Florida. Several French laboratories are along for the ride. An Atlas V launcher lifts off on 26 November from Cape Canaveral, Florida, with the Curiosity rover. Credits: NASA/JPL-Caltech. 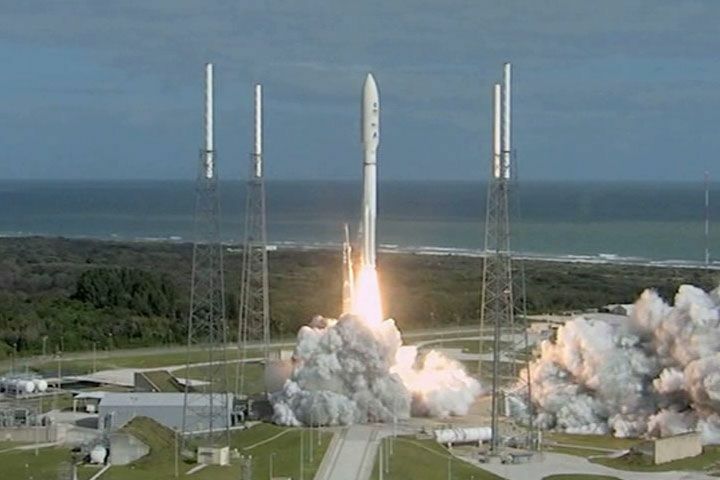 The Curiosity rover on the Mars Science Laboratory (MSL) mission lifted off from Cape Canaveral, Florida, on Saturday 26 November at 16:02 CET (10:02 local time) aboard an Atlas V launcher. Weighing 900 kg, Curiosity is by far the heaviest rover ever sent to explore Mars and also the most sophisticated, carrying 10 scientific instruments weighing a total of 80 kg. Among these are ChemCam and SAM, to which France has made key contributions. ChemCam (Chemistry Camera) will perform selective analyses from a distance of soil and rock composition within a radius of between 1 and 9 m around the rover. SAM (Sample Analysis at Mars) will do in-situ analysis of Mars’ soil, near-surface subsoil and atmosphere. It will look for chemical compounds related to carbon, including methane, associated with life. After a 570-million-km journey, Curiosity is scheduled to land on the surface of Mars in August 2012 at the foot of a 5,000-m mountain inside Gale Crater.